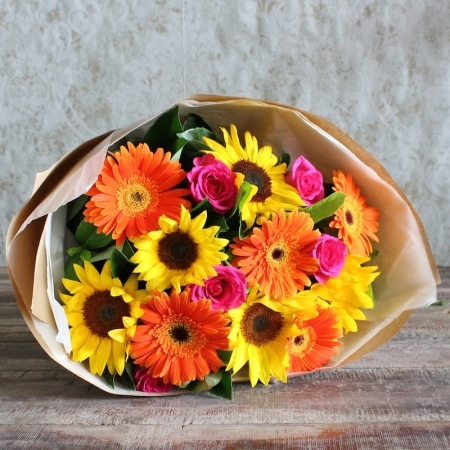 A stunning bouquet enriched with vibrant colours like the hot pink in the Roses, sunny yellow of the Sun Flowers and the bold orange of the Gerberas. We are sure this bouquet will brighten their day. It is presented in the organic brown kraft paper and finished off with a natural ribbon to match. A wonderful addition to our ECO Collection, `Enriched Colour` can be ordered online or by calling one of our friendly staff on 02 9871 1666.